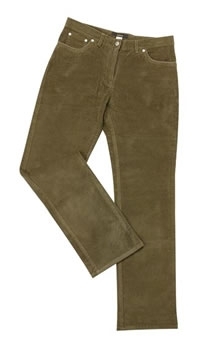 Ladies Stretch Cord Country Jeans by Barbour. These bootcut, stretch corduroy jeans are from Barbour Country range for ladies and have a 98% cotton 2% Elastane outer for comfort. Barbour branded studs and rivets. Alcantara (Polyester) trim on front pockets and rear yoke detail. Machine washable. Five pocket styling. Zip fly. Finished length 32 inches (77cm). The Ladies Stretch Cord Jean by Barbour is available in U.K..SALE!